Buster Moon is a dapper koala who presides over a once grand theatre that has fallen on hard times. Buster who is the eternal optimist – okay, maybe a bit of a scoundrel – will do anything to preserve it. Now facing the crumbling of his life’s ambition, he has one final chance to restore his fading jewel to former glory by producing the world’s greatest singing competition. The hustling theatre’s impresario holds city-wide auditions. Five contestants emerge: a loud-mouthed mouse, timid elephant with an incurable case of stage fright, a pig mother to 25 little piglets, a getaway driver gorilla and a punk-rock porcupine. Stars Matthew McConaughey ('Interstellar', 'The Wolf of Wall Street'), Reese Witherspoon ('Walk the Line', 'Wild'), Scarlett Johansson ('Lost in Translation', 'The Avengers'), Seth McFarlane ('Ted', 'Family Guy'), Taron Egerton ('Kingsman: The Secret Service', 'Eddie the Eagle') and Tori Kelly ('The Voice', 'Sunday Brunch') lend their pipes to the show-stopping numbers in 'Sing'. The 'Sing' competition has now closed. Winners will be announced shortly. Competition opens at 5pm AEDT on Sunday 26th March 2017 and closes at 11:59pm AEST on Sunday 2nd April 2017. Five winners will be chosen at random on Monday 3rd April 2017. To successfully win, entrants must fulfil the above entry conditions before the time the competition closes. Current members/followers are eligible to enter the competition. Only one entry per person. Only one winner per household. To be a valid winner, the entrant must not have won a prize from SWITCH within the last 28 days. 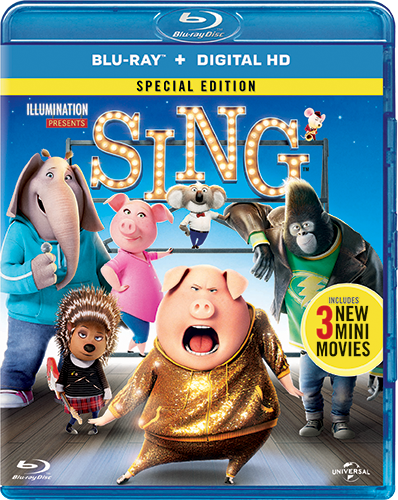 Each winner will receive one Ultraviolet Blu-ray copy of 'Sing'. By entering, you agree to receive occasional emails from SWITCH in the future. If you decide to unsubscribe from these updates, any further entries will not be applicable. Only Australian residents are eligible to enter. 'Sing' is available on Digital, Ultraviolet 4K Ultra HD, Ultraviolet Blu-ray, Ultraviolet Blu-ray 3D and Ultraviolet DVD on Wednesday the 29th March 2017 from Universal Sony.